Production by Hangzhou Yue Opera Company, commissioned by Ibsen International. Ming dynasty, an island, a festive night. Lida eagerly waits for her sweetheart, sailor Jiang Siteng, who hastily arrives only to bid her good-bye. Falsely accused of killing his captain in a tavern brawl, he decides to run away but promises to come back to fetch her. By the sea under the moon, the two enact an engagement ritual and toss their interlocked rings into the sea, vowing eternal love.With no news from Jiang Siteng for many years, Lida is now resigned to her marriage to Fan Ge, a much older widowed country doctor on the mainland. The normalcy of life was disrupted when their young son died. Rejecting her husband and his attempts to heal her, a grief-stricken Lida seems to verge on a mental breakdown. Dr. Fan asks Bolai, his daughter from the previous marriage, to reach out to her step-mother.Lida reveals to Bolai her secrete engagement to a sailor, whom she had virtually forgotten until she saw him again in the eyes of her dying son. In return, Bolai admits that she also harbors a longing for the sea, because she remains fascinated by the sea legends told by her former tutor, Anhong, who happens to be Lida’s hometown neighbor. Dr. Fan invites Anhong back from the island for a visit, hoping it may help Lida. Anhong’s return not only changes the course of his relationship with Bolai, but also brings the news of Lida’s sailor, who shows up presently to ask Dr. Fan to release his wife. In the moon light, Lida and her sailor are making a run for the sea…..
What happens next? Will our lady of the sea follow her sailor to the end of the earth? Or will she return to the fold of her life with the doctor? 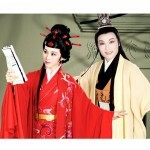 Yue Opera, performed by all female actors, is one of the most popular traditional operas in China. It originated in Zhejiang province, which used to be the state of Yue in the ancient time. It started as a form of story-telling and ballad-singing, evolving into a theatrical genre with the addition of dramatic structure and an orchestra. 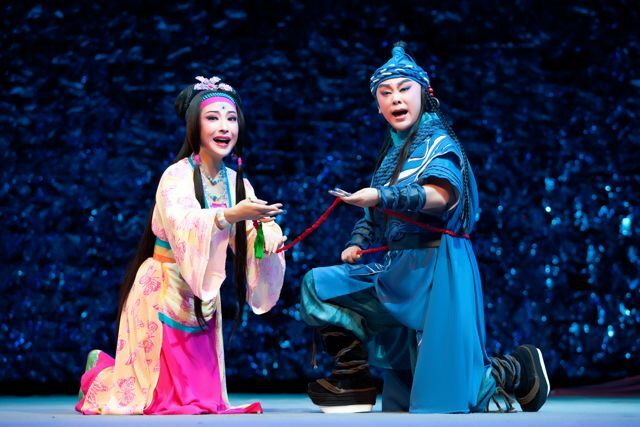 Yue Opera is particularly strong in its lyrical touch, with singing and gesturing as its main acting modes. 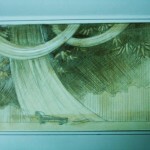 Its arias follow certain patterns which are delicate and beautiful, reflecting the special aura of southern China. In the past 100 years, Yue Opera has established its own distinct style while learning from other theatrical structures such as Beijing Opera, Kunqu Opera, Shao Opera, modern drama, and film and television. Being in contact with Ibsen’s famous works such as A Doll’s House since his youth , Mr Zhan is still very interested in Ibsen’s work. 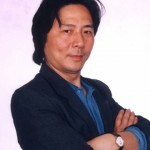 He is vice president of Hangzhou Yue Opera Company and was in charge of the play Hedda and now also for The Lady From The Sea. Interestingly, in the Yue opera, the name of drama is Aspiration Sky High instead of Hedda Gabler. In this new Yue play, we creatively transplanted the story in ancient China, new look, fully integrated into the Oriental culture. The audience had found that in the play, the scene and the characters had been removed to ancient Chinese, but, most important thing is , the sprit of original work is never changed. In 2005 , Aspiration Sky High was premiered. Its excerpt went to Oslo in January , 2006, as part of the gala performance inaugurating the Ibsen Year and was highly acclaimed. HYO’s actresses were received by the Norwegian King and Queen, and were invited back with full production in September to participate in the Ibsen Festival. In May, 2006, Aspiration Sky High was a part of the Forth Beijing International Theatre Festival. – What will be the main difference from Hedda to the Lady? Two plays are all selected from Ibsen’s plays. By comparison, Hedda Gabler, reflects the era of the West a century ago. Hedda is one of the first fully developed neurotic heroines of literature. She is neither logical nor insane in the old sense of being random and unaccountable. Her aims and her motives have a secret personal logic of their own. She gets what she wants, but what she wants is not anything that the normal usually admit, publicly at least, to be desirable. While The Lady from the sea is about a lady called Ellida, the play show a special woman’s choice of freedom and identity recognition, as well as the relationship of body and environment, the existence and ideal of women. Interestingly, this play is more in-depth psychology of women and easier to be accepted by modern Chinese audiences. Although two plays are all about human freedom especially about freedom of women ,but the way of expression is different, Hedda is walking towards the ruin and suicide herself in the end, while Ellida went back to self- identity recognition ,and longed to find herself what was exactly herself, it’s the main differences of these two plays. The reason way the their outcomes are different is their backgrounds. Hedda want to conquer men, but in the fact she fail, Ellida want to find the love, and finally she find the truth of life. 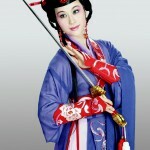 – Is it common that the leading character in Yue Opera is a woman? Yes, it’s common, but actually in the Yue Opera one play is often starred by actors and similarly by actresses, we called Xiaosheng and Huadan, the former has examples such as The butterfly lovers, Dream of the red chamber and Kongzi etc. , the latter like Hedda and The Lady From The Sea are also very common. Some very famous Opera’s actors are men who act as female character on stage and look more feminine than a woman. Many specific drama characters (e.g. the Monkey King ) have their own specified mask. – Will these two Ibsen plays make a change in the tradition of Yue Opera? If yes, how? Perhaps this situation has already occurred, you know, cause Chinese Opera has a tradition and a set of pattern, one of significant feature is playing stories through dancing and singing, their so-called stage time is slow, while in the western dramas, the time is normal, this let you concentrate and focus on the story. Western drama has patterns itself. By comparison, Yue Opera also play to their advantage, big plus interpretation of scholar-beauty of snuggling lingering, the hero and heroine of the Empress Dowager of love, manifesting Earned dripping. Script monologue, dialogue gentle graceful, like “The Peony Pavilion”, “The West Chamber” or “butterfly” in the fore, it is well known. The adaption of these two plays, make a change in the tradition of Yue Opera, for we are now facing the problem how to combine the advantages of both. Chinese and Western charm, creating a new chapter in Yue opera artistic innovation. – What will be your main focus in the Lady? Since its founding over 50 years ago, Hangzhou Yue Opera Company has become a key art performing institute in Hangzhou City. For half a century, the theatre created and performed more than 100 different performances, trained groups of outstanding talents and gained profound achievements, well received by domestic and overseas audiences of all ages. Especially in recent years, the theatre continuously cultivated excellent actors, created great plays, gained effectiveness, has achieved outstanding success. Hangzhou Yue Opera Company has created a series of plays deeply welcome by the audiences and affirmed positively by the opera experts. The main plays include “Winter Story”, “River of Rouge”, “Lotus Lake”, “Pear Flower Love”, “Flower Floating Brook”, “Winter Bird”, “Amorous Dream of Liang Shanbo and Zhu Yingtai”, “Love Along River Qu”, “Juvenile Emperor”, “Cutting Flower Love”, “Walking and Singing on the Avenue”, “A Wisp Flax”, “Hedda or Aspiration Sky High”, “The New Lion’s Roar”, “Women Street” and some reserved traditional Yue Opera classics, such as “Jade Hairpin”, “Jade Dragonfly”, “He Wenxiu”, “Pearl Tower”, “Emperor’s Complain”, “Inquiring Husband”, “Snow Marriage”, “Meng Lijun”, “The Story of Burning Incense”, “Chen Sanliang” and so on. Hangzhou Yue Opera Company has a wealth of shining talented Yue Opera stars with various performing genres, of whom many have already won admirable prizes and titles of art star in various national, provincial and municipal opera fairs. Some young excellent actresses, such as Xie Qunying, Chen Xiaohong and Chen Xueping, have respectively won the 15th, the 19th and the 24th “Plum Blossom Awards”, the highest honorary award to individuals in the national opera arena. Xie Qunying and Chen Xiaohong also won the “Wenhua Performing Prizes” awarded by Ministry of Culture. 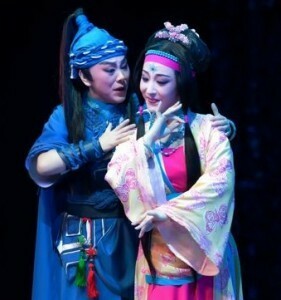 Shen Zhumin and Zhou Yujun respectively won the 13th and 19th Shanghai “White Magnolia” Opera Performing Supporting Actor and Leading Actor Prizes. Hangzhou Yue Opera Theatre has made breakthroughs successively to win the national level prizes. “Pear Flower Love” participated in the 5th National Opera Festival as the only Yue Opera play and won 11 prizes including the “Excellent Play Prize” and etc. It also won the 8th “Wenhua New Play Prize” awarded by Ministry of Culture, “China Cao Yu Drama Award”, “Luxun Literature Prize” of Zhejiang Government and “Five-One Project Prize” of Zhejiang Province. The fairy story music drama “Winter Bird” took part in the National Excellent Children Play Exhibit held once every four years and won the “Excellent Play Prize”(the first place) , together with other 9 single prizes. It was also awarded the national “Five-One Project Prize”, the 10th “Wenhua New Play Prize” of Ministry of Culture, “China Cao Yu Drama Award”, “Luxun Literature Prize” of Zhejiang Government and “Five-One Project Prize” of Zhejiang Province. Besides, “Winter Bird” also won the “Special Honorary Prize” in South Korea International Youth and Children Art Festival and it was invited twice by the Ministry of Culture to Beijing for performance. “Flower Floating Brook” won the “Wenhua New Play Prize” in the 7th National Art Festival, “China Cao Yu Drama Award”, “Luxun Literature Prize” of Zhejiang Government, 19 prizes including the “New Play Prize” and the “Audience Most Favored Play Prize” in the 9th Zhejiang Opera Festival and the 3rd “Japan-China Drama Friendship Prize”. “Hedda or Aspiration Sky High” went to Norway twice to attend Ibsen Drama Festival and Memorial Activities, took part in the 3rd Paris Chinese Opera Festival in France and won the “Most Innovative Award” and the “Best Young Actor Prize”. What’s more, it also won the Silver Prize in National Yue Opera Art Festival, “Five-One Project Prizes” of Zhejiang Province and Hangzhou City and the “Play Award” in the 10th Zhejiang Opera Festival. The new light comedy “A Wisp Flax” won the “Play Award” in the 10th Zhejiang Opera Festival. “Walking and Singing on the Avenue” which reflects the Confucius culture won the “Five-One Project Prize” of Zhejiang Province. Urban modern drama “Women Street” won the “Five-One Project Prizes” of Zhejiang Province and Hangzhou City. 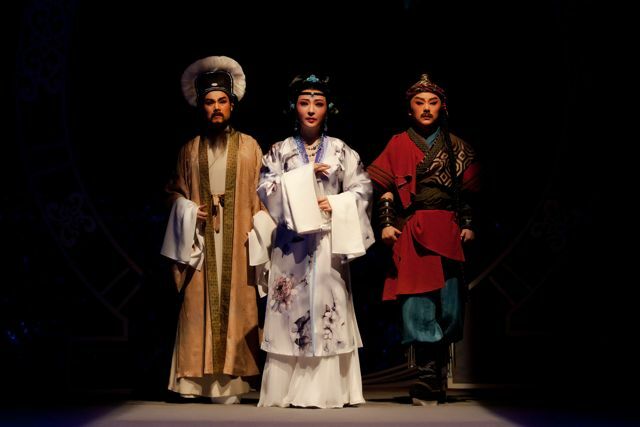 Most of the plays presented by Hangzhou Yue Opera Company are generally permeated with strong local cultural characteristics of Hangzhou as a famous historic cultural city. They enjoy unique artistic charm and are widely welcome by people at home and abroad. For years, Hangzhou Yue Opera Company has been playing an active role in the performance arena in some major cities, such as Beijing, Shanghai, Nanjing, Wuhan, Tianjin, Changsha, Guangzhou and Shenzhen, etc. The theatre was invited to take part in the international events in Japan, Korea and Norway respectively for twice and France for once, and visited USA, France, Canada, Brazil and Hong Kong, Macao and Taiwan regions for many times with performances, all with great success. Hangzhou Yue Opera Company has a very good reputation in China. With numerous talented Yue Opera performers’ dedicated devotion, it presents an exciting atmosphere of vivid prosperity. It is marching steadily towards the glorious tomorrow of art. – What do you think about the character Ellida Wangel? From the introduction that I have gotten, I known that this play is about a lady called Ellida. She is the daughter of a lighthouse-keeper, and grew up where the fjord met the open sea; she loves the sea. She is married to a doctor in a small town in the mountains. Ten years earlier Ellida was deeply in love and engaged to a sailor, but because he murdered his captain he had to escape. Nevertheless, he asked her to wait for him to come and fetch her. She tried to break the engagement but he had too great a hold over her. Many years later the sailor returns to claim her. However she then has to choose between her lover or her husband. Dr Wangel finally recognizes her freedom to choose since he understands that he has no other options. Sfter this Ellida chooses her husbond. The play ends with the sailor leaving and Ellida and Wangel taking up their lives together. – In my opinion, Ellida is daughter of sea, she can’t be content living with a normal doctor, for she has her own purpose of life: pursuing the freedom. She is a mixture of wild and naive. While she got the freedom, she made the choice for herself, surprisingly, she chooses taking up their lives together. This strange end maybe tells people what is the true freedom of human. – How will you work to find her? In Yue Opera version of The Lady From The Sea, the author of the adaptation reduced the figures to five: Lida (Ellida), sailor (the stranger) medical doctor (Dr. Wangel), a daughter and a narrator. I fully understanding the sprit of this opera, it does not seem strange to the Chinese, I can consider the whole theme is identity recognition of a woman, also I can say the deeper meaning is about harmony of life, about compromise of human and the environment .The freedom is important, before we possess it, it is hard to find, but after we own the freedom, we will choice the true life. Is it right? 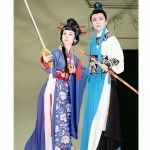 By the way, Yue Opera is a perfect combination of ancient Chinese music, poetry and dance. Harmony and balance are two very important concepts in a Chinese opera. The actors and actresses must find the suitable way to express the feeling through singing and dancing by stepping on the musical trays and drums. – Thoughts about marriage in China today, passion or sensibility? Marriage is now viewed as an entirely private affair. Lifestyles have diversified into those of celibacy, single-parent families and cohabitation. People select the mode they believe will make them happy, rather than going along with the majority. Marriage and the family in rural and urban China are evolving into more diversified, rational, and progressive institutions, as the concept of gender equality becomes more widely accepted. Nowadays, people tend to adapt to the environment instead of pursuing for freedom regardless of surrounding. Actually I believe that this is the theme of the drama, Ibsen wants to tell people what to do before we own the freedom and after we possess the freedom. – Is it different to play a usual Yue opera female role and Hedda? I don’t know how to play a drama, for I have not yet got a opportunity to act in a drama, but I think I fully understanding the feeling and situation of the role through reading and reading the script, for I believe that there is no obstacle between a drama script and a Yue opera script. Talk about the Hedda, unlike the other people’s opinion, I consider that she is a pure woman with very simple feeling. So, firstly, I need to find her, then I should do like Hedda does, and say what Hedda says. Hedda’s behavior delegates the common people’s desire. As a woman, I think we are all the same. But the difference is Hedda’s character is straight forward. To deal with the character the best way is to understand myself well, for every woman has same feeling. By the way, in Yue Opera ,we have traditional way to train actors and actresses which be called “four skills in the five Law”, like in Traditional Chinese Medicine , we stress so-called eight principles. I use the way of Yue Opera such as sleeve dance and hand-eye coordination physical performance to express the feeling of Hedda, equally of myself. – How did you work to find all the different sides of Hedda? To fully understanding the character of Hedda, I need to overcome the sense of reality, the different backgrounds of two centuries, besides there still is something to overcome, such as the cultural background and atmosphere. Tough I regard the Hedda as a noble, proud, inferiority, and simple woman, her pride is born naturally, to put it on the stage, I still have long way to go. The process include the pieces from imitation, anatomy, other company rehearse, improvement, constantly changing and adjustment, exploring through practice to prove being successful. I must concentrate on the main method’s expression through the action, I must lean on the advantage of Yue Opera ,for it’s good at aesthetic, but the shortcoming is that a actor or actress always need to hide the truth of the character. On the stage I present a kind of character and remember that it is Hedda’s other side of the character too. – How was the reaction from the audience? From beginning, the experts worried about the character of the role, for on the people’s traditional opinion, Hedda is not a good woman. But actually, in a modern theatre, audience’s opinion is changing rapidly, for example, nowadays, the younger generations have become accustomed to watch something broken on the stage, instead of watching the simple plots such as “one good turn deserves another”. Approximately, about one fourth of the audience could not accept the Haida(Hedda) five years ago. The reason is simple, they said that there is no such person around like Haida, gradually, more and more people accept it . – In your opinion do you think that Ibsen’s text changed the content of the Yue Opera? No, the main difference of the drama and Yue Opera is the way of story-telling as well as the adaptation. The original drama have length of five acts, but we only choose one act. Besides, in the end of the play, I use the different suicide method by a sword instead of by a gun.